Itchy dog? Advantix can help! Keep your pooch safe from the ravages of fleas, ticks, and other pests, with K9 Advantix II. Not only does Advantix kill all stages of flea life (egg, pupae, larvae, and adult), as well as a wide array of ticks, biting flies, and chewing lice, but it also repels them for a full 30 days. Also, K9 Advantix 2 kills and protects against mosquitoes, which are the only transmitter of heartworm disease. Advantix starts working within 12 hours of application, and is also safe to use on dogs as young as 7 weeks old, so protect your dog with K9 Advantix II as soon as you can. 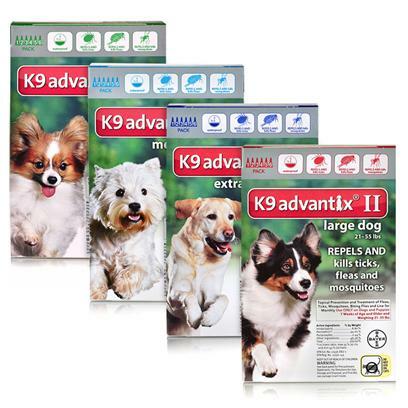 Per monthly dose, K9 Advantix 2 is more affordable than Frontline Plus for Dogs. KEEP AWAY FROM CATS. Cats are unable to process the key ingredients in Advantix. They should be distanced from the dog for up to 24 hours after application. Some dogs may experience a burning, itching, tingling, or numbness of the skin after application. This sensation usually subsides within 3 days, however if symptoms persist, consult your veterinarian. Have your dog stand to ease the application process and evenly distribute the contents of one tube on 2-3 spots along their back, between their shoulders and the base of their tail. Part their hair so that skin is visible and gently squeeze the solution onto the skin. Make sure there is no excess dripping, and allow 1 hour to dry.